Honda (UK) is celebrating success after two of its models - the CBR500R and the NC750X - received winning honours in the 2014 Auto Trader Bike Awards. The fully faired twin-cylinder CBR500R, which is aimed at riders looking to move up from a 125cc machine or those holding an A2 licence, was named as the best bike in the A2 category, while the adventure-styled NC750X all-rounder was awarded Best Commuter. Jon Quirk, Editor-in-Chief of Auto Trader Bikes explains: "When we were discussing (the A2) category, there really was only one manufacturer in contention. Honda has three excellent bikes in this field - the CB500F, the CB500X and the CBR500R, but we found that the fully-faired, sports-orientated CBR500R was our best all-rounder." Auto Trader praises the CBR500R as being "the complete package... affordable, really versatile, an effortless entry-level bike, a great commuter and you can still have fun with it at the weekend." To view Auto Trader's full review of the CBR500R, click here. The NC750X was named outright winner in the Best Commuter category for its practicality, ease of use and economy. Quirk applauds the model for offering "the refinement of a big bike, the practicality of a tourer and the economy and ease of use of a twist-and-go maxi scooter, thanks in part to that brilliant dual-clutch gearbox." To view Auto Trader's full review of the NC750X, click here. Both models are available now through Honda dealers nationwide. The CBR500R ABS is priced at £5,499 OTR and can be purchased on a three-year finance deal, which includes a free Super Sports Pack until 31 December 2014. The NC750X is priced at £6,299. 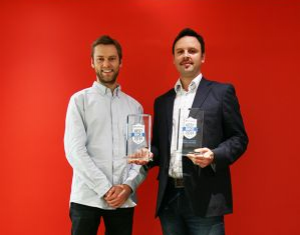 "We're really pleased to receive two Auto Trader Awards and for both models to receive such high praise for their key features," said Nick Campolucci, Head of Motorcycles at Honda UK. "This is the third award that the CBR500R has received this year, as it was also named the 'Best Sub-500cc Motorcycle' by Motorcycle News and the 'Best A2 Bike' by Visordown."